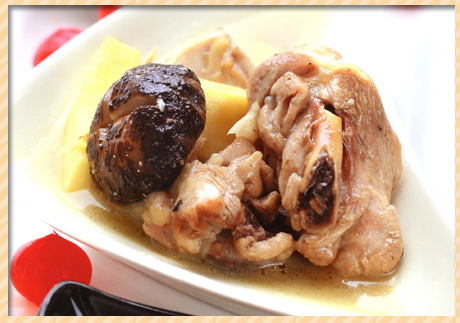 Chicken cooked in wine is a dish that transcends cultures and borders. The French have their coq au vin, the Italians have pollo al vin cotto and chicken marsala while the Chinese cook chicken in red wine as well as a variety of other wines. This East-Malaysian recipe has flavourful free-range chicken cooked in Lihing, a Sabahan rice wine made by fermenting glutinuous rice. Prepare chicken and cut into bite-sized pieces. Deep fry in the oil until haIf-cooked. Heat up a little oil in a pan and fry onion, shallots, garlic, ginger and Iemongrass until fragrant. Add the chicken, coconut shoot, mushroom, chicken stock, rice wine and salt, then boil together for 5 minutes.